Order up! Today's special is vinous, figs and caramel in a glass. It comes with a side order of slick and warming sherry notes but not too burning. 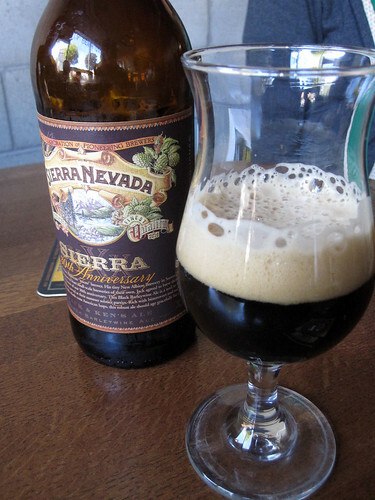 You can upgrade to a thin sherry with prunes, herbal and floral hops. For Dessert: extra alcohol vapours are on the house. A little thin for a big ABV. Appearance +1 full label and organic! This glass emitted a fear inducing odour of alcohol soaked cherries, earth and wood. These scents can either be from a fresh grave or a barley wine; luckily it was the latter. Thin alcoholic malts gave more warmth than expected. The real shock came from copious amounts of caramel, brandy, minerals and earthly, resinous hops. Flavours still resonated long after the glass was empty. No preamble here; gotta get through these notebooks. Even the Boy Scouts could not make a campfire that smells this good. Voluminous amounts of ash, campfire, bittersweet chocolate, coffee and Girl Guide aromas are released by the bottle opener. Every sip is like a burnt s'more: bacon, rich chocolate, coffee, vanilla and cocoa powder. The more you drink, the more you taste. This stuff never ends; the slick, powdery finish talks of a hot chocolate chaser. STELLAR BEER. I hate doing reviews like this. They equate me to some basement dwelling beer hater. Well.. I am in a basement but I do not hate this beer. However, I have had a few brews and a full dose of Battlefield Field 3 video game adrenaline rush: here it goes. This beer lacks focus. It has too much flavour to be an American Pilsner. It was too sweet and unattenuated to be a German Pils. It is more in the Bohemian range. Perhaps it is just my West Coast palate crying out for more hops. There is a Victory Prima Pils in my fridge calling my name; perhaps the greatest beer I have ever tasted. My soul was crying for a local Prima Pils that could be obtained by the growler full. Forevermore contentment would fill my heart- and stomach. However I am being unfair; this is a tasty beer. This beer was sampled twice; in growler and bottle. Did I mention that I got growler #8? The aroma came across as faint with straw with some honey and a little lettuce (not DMS). Chewiness is not something I look for in a Pils, but the Hoyner had some. Each sip was a little on the honey/sweet side. There was enough honey, lettuce, spices and herbal goodness to keep the palate active. Normally Pils end like a door slam; this one lingered with a honey and straw slickness. Not unpleasant - just unexpected. People will like this beer, perhaps one of the best Pilsner styles produced in BC. Beer geeks might say: dry it out, add more late edition spicy hops and then call me. This is an ice barley wine. I have never heard of this style of beer. There are ice bocks (ie. eisbocks) and yours truly once brewed an eisdunkle. Everyone's favourite Hermannator is an eisbock. To brew an eis-anything you take the finished beer, freeze it and use the unfrozen liquid. The fancy term is called freeze distillation. When you freeze the beer, only the water forms into ice. The remaining liquid is higher in alcohol - and usually - higher in flavour. I have a few reservations about this beer. The first is that it is only 12%ABV. A barley wine runs about 10-12 ABV% already. Old Cellar Dweller is 12% ABV and Phillips Trainwreck is 10% ABV. If it was freeze distilled three times - as the label claims - where is the big jump in ABV? Everyone's favourite gimmicky brewers - BrewDog -have done frozen beers before. The Tactical Nuclear Penguin was frozen twice? and it hit 32% ABV. Sink the Bismark was frozen four times and it hit 41%ABV. So why did a thrice frozen beer increase so little in ABV? The second reservation is a minor one. It comes in a twist off bottle? Not very suitable for aging. This is a style of beer that polarizes people. You either drink it all the time or never touch the stuff. I fall into the later group, which is a fault I'll admit to. To me most pale ales are ..well... pale. Perhaps this is a fault of many beer geeks. When I stand in front of a beer cooler deciding how to spend my limited imbibing funds, the pale ale never enters my mind. Go for the imperial stout, or grab a saison; these are the thoughts I get. However there is a time and a place for a beer that is not a palate challenge. Sometime you need a casual refreshing brew; this is where the Down Easy comes into the picture. This beer does not shock and awe, but it is enjoyable. The nose is pretty standard: faint floral, toast and mild citrus. It's light, creamy mouthfeel carries ample light caramel and bready/biscuity malts. These are accompanied by a balanced accompaniment of citrus, herbal and mild flowery hops. The balance was nice; maybe a little hop unfocused. Down Easy's ending was a tad sticky with a quick ending floral bitterness. It would have been nice to have a good hop snap at the end. It is what it is; an easily enjoyable beer. This will be a tough week for me; so many new beers to try. The line up this week is the Belgian Black by Lighthouse, the first two beers from Hoyne, and a frozen barley wine from Phillips. I choose the Lighthouse first. Most beer geeks in Victoria will be familiar with the nose; it smells like a ramped up Keepers. There is nothing wrong with this. I love Keepers stout. The air just oozes aromas of berries and roasted bitter chocolate. Each sip is just as your would expect: low carbonation, full mouthfeel, thick, chewy and warming. Heaps and heaps of flavours emerge. Some are expected; namely the bittersweet dark chocolate, coffee, berries and dark fruit. Not expected was the faint spiciness (allspice) and rum cake. The spiciness is most likely due to the Belgian Ardennes yeast strain used. The astringency from the bittersweet carried a long linger of warming alcohol and spice. Very tasty and well worth trying, maybe more than once. This is one of those old, resurrected style of beers. Similar to the alt and the witbier. There is a very good write up about this style in Imbibe magazine. It is an unfiltered, slightly sour wheat beer that has added spices, one of them is salt. There is a lot going on in this little glass. The yeasty nose is apparent along with complimentary tart lemon and vague spiciness. Big carbonation is the name of the game here. As you might expect, there is ample tartness with lemons, other citrus, wheat, spices and a mouthpuckering sourness. I think the salt comes across in the cider-like dry finish that leaves hints of sour grapefruit. Well done! There is no beer to compare to this one! Sticking with the theme of the three fruits, here is the local raspberry addition to their strong abbey style ale. A sweet, syrupy raspberry odour jumps from the glass. The cider-like, raspberry sweetness packs a fair bit of astringency and tartness. This will certainly appeal to cider drinkers. The cooling at the end carries the berry flavours away quickly. I thought it was a little sweet, but the Mrs. quite liked it. "Sticke" means secret in some circles. I guess every beer could be called "sticke', since most brewers do not post their recipes. Except for Stone Brewing; every year they post the complete recipes for their EPIC ales. It could also refer to a slightly stronger alt that is brewed in limited release. The secret is out, this beer is pretty good. The roasted, fruity nose is not unexpected from this dark brown pour. Each sticky sip provided ample toffee, roasted coffee beans and resinous hops. Even the herbal hops and slight green apple - not tart- flavours did not seem out of place. Can beer bloggers make resolutions? Sure we can; this year I will make three resolutions. First: Try each new release from Victoria breweries. This will be a tough one because Hoyne will have all new brews. VIB, Moon Under Water and Lighthouse have done many releases last year. Second: Get the Extraordinary Badge on Untappd. That means you have sampled 1000 unique beers. I'm at 584 already. Third: I know I have said this before; try and get all my 33Beer notebooks reviewed. This one is a pipe dream. The nose is mostly tart black currants with a little yeast thrown in. At the start a pronounced black currant flavour coats every dental filling with a pleasant tart/sourness. The slight carbonation carried an afterthought of tastes: apricots, light pit fruits and raisins. Sour currants lingered for a while with it's good friend alcohol warmth. This is not the most unique beer in the world, but the added fruit flavours will appear to a much larger crowd. People who are not usually beer people will enjoy this beverage. The other flavours in the limited release fruit ménage à trois are raspberry and cherries.